I got caught up with chores during the afternoon so I made it down to the beach quite late, and was on the water at St Kilda at about 6pm. 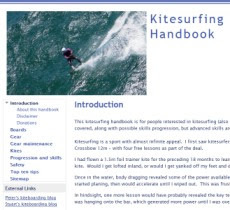 There was a good south easterly sea breeze so I headed out past the breakwater, picking my way through the learners with their kites parked at 12 o'clock. Being late in the day, it was not too crowded. I got a couple of good runs in out from the breakwater, but there wasn't enough wind to jump. Then the wind dropped so I headed to the beach and walked back. It picked up a bit while I waited, so I headed out again and was the only one out apart from the beginners.